Tell me about your saddest, “I seriously can’t be bothered today”, laziest dinners. 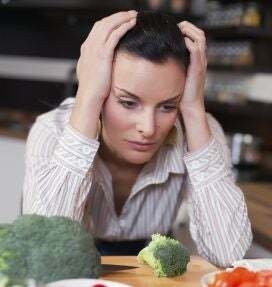 Days where making something nice just makes you feel like this lady, who appears to be contemplating her life choices and wondering how she ended up in front of this sad piece of broccoli. I just had oatmeal and a hunk of fancy cheese. I might have a pickle. I could have done the responsible thing and made something resembling an actual healthy meal, or at the very least order takeout; but it’s so hot and I’ve had such a long day that I just don’t care.